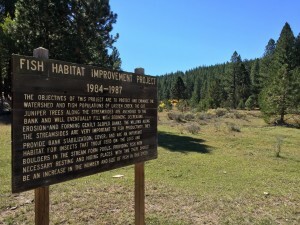 On October 7 I made my way out to Modoc county in search of the Goose Lake redband. At first I couldn’t find an area to easily access the water without going into private property. Thankfully a few hunters in a nearby campground pointed me down the road to a clearing where they saw fishing-related signs. 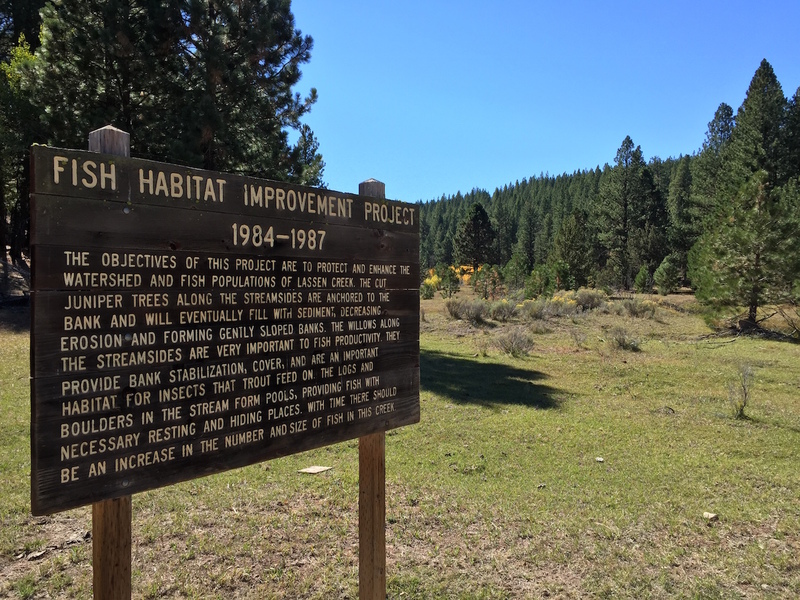 Those turned out to denote the area where a fish habitat improvement project was underway – I found the right spot to fish! I spent a few hours walking the banks of the creek hoping to catch a glimpse of fish scurrying about. 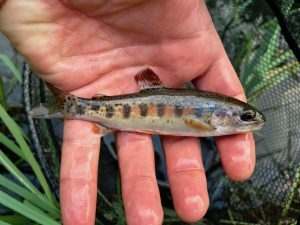 As with all of the smaller species of trout this species seemed to spook rather easily… so I had to approach the area I wanted to fish slowly and quietly while keeping my shadow out of the water – a surefire way to spook fish! 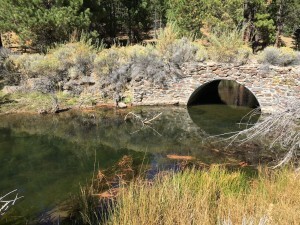 I spent some time at a larger area of deeper water in front of a stone bridge where a few larger trout were suspended in the center. 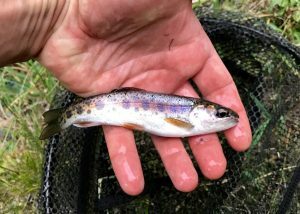 I eventually caught a single trout with a tiny nymph. The picture below doesn’t do justice to the Goose Lake redband’s nice coloration – spending time to get a photo of it in the right light wasn’t my highest priority, rather it was getting the fish back into the water quickly and safely. On August 12 I stopped off at to catch another Goose Lake redband after catching my first Warner Lakes redband earlier in the day. 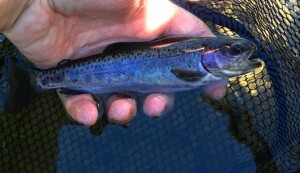 As I plan to catch all 11 heritage fishes (and get all on two different certificates) I therefore needed to catch another one of the 6 qualifying species I’ve already caught. Here are the two Goose Lake redbands I landed in the early evening hours. So nice to visit this creek again.